Here is Sunset over the Sleeping Ute Mt. 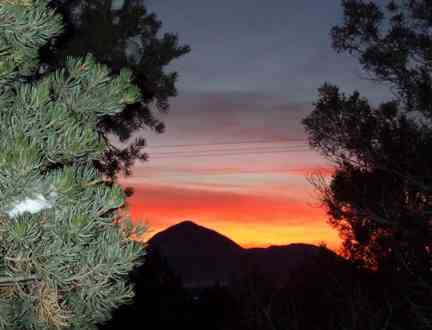 on Dec. 27th from our front porch, looking southwest to The Navajo Rez, across the top of Cortez. The Four Corners Monument is another 20 miles beyond the mountain, and then Teec Nos Pos another 10 miles after that. We got about 4-6" of snow over past 3 days and now its very cold so maybe it'll last awhile. 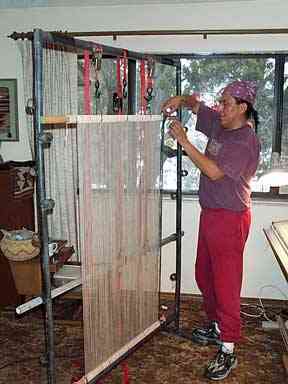 Roy is over for 2 days as we are setting up some weaving projects to do here at our place, together. 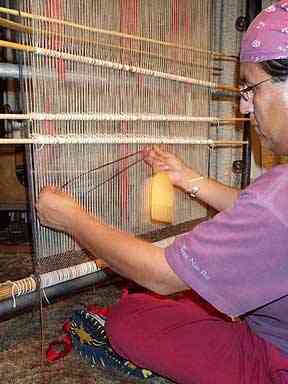 He is setting up a saddle blanket loom to weave us a diagonal patterned twill like the super old good ones. No one is weaving these types today so Roy is learning a few things himself. We've collaborated on colors and design and are weaving together Wednesdays from now on over at our place. I'm using his inspiration and company to take up weaving my own rug again. Mine has been on my loom 10% done, my 12th one, size 44" x 76", since about 2 years now while I've been doing 100% restoration instead. but weaving is a lot more fun so I'm taking a day off a week now to really enjoy myself again with Roy also weaving what will be a tour de force piece in the end, about 30" x 50" or typical old saddle blanket size. He's spending the night then we are going over to the northern Holy Mt. of the Navajos, Mt. Hesperus, about 20 miles east, where he will perform a traditional New Year's Navajo Blessingway Prayer on the mountain (or at least near it) using corn pollen. Here is a photo of his twill coming along last night. He started weaving around 4-5 pm off and on. You can see his weaving comb blurred here in this photo as he's weaving.